Dentistry has allowed me to help people improve their health and confidence with a beautiful smile. I love working with my hands and creating smiles that are more like pieces of art. I am excited to see my patients smile and be amazed at their finished restorations. It is very satisfying work to change lives. Through continuing education, I am able to stay on the cutting edge of current dental treatments and always offer my patients the most sophisticated treatment options. I attend state, national, and local dental conventions, as well as other continuing education courses, to stay informed of new procedures and technology. 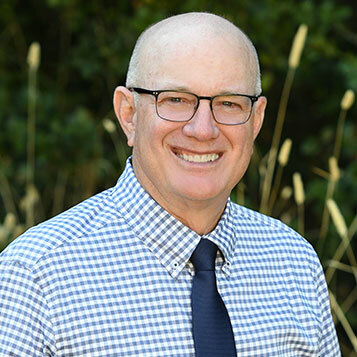 I grew up in Yuba City, California, and have lived in the Rocklin/Loomis area for more than 35 years. I have been married to my wonderful wife Linda for 40 years, and we have six children who are all married. 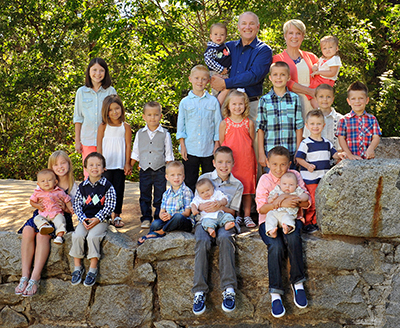 They have given us 22 grandchildren! We also have a pointing yellow lab named Zip and a small parrot named Molly. My son Jacob graduated from West Virginia University School of Dentistry and has now joined me in practice. We have another son, Joshua, who graduated from University of Louisville School of Dentistry and he practices in Northern Colorado. My free time is spent doing anything I can outdoors: snow skiing, scuba diving, fishing, archery hunting, camping, boating, water skiing, and hiking! My favorite place to take my wife is the Mayan Riviera. She can relax and I can scuba dive! I feel it is important to serve in the local community and have tried to stay informed about local areas of need. When the kids were young, I sponsored several sports teams in our community, coached Little League baseball, and was a scoutmaster. These days, I focus my efforts on church service projects.